What if I told you that the world as we know it and what we have been told for generations, and passed down in our history books and schools wasn’t true? It is said that humans were primitive and evolved to the state that we are at now… that we have never been as technologically, physically and emotionally more advanced as this moment in our evolution. Archeologists have painted a picture over the last 100 years of how we evolved from an ape like man into hunter gathers and then with the introduction of agriculture we began our advancement into the modern age. I am here to tell you now that that is all incorrect and there is more evidence about to come out and hit the mainstream outlets that will disrupt the commonly accepted timeline and shift our awareness to a greater understanding of who we are and where we came from. The truth is we are not the most advanced civilization who has ever walked on Earth. Humans have walked this planet for 100’s of millions of years, ancient civilizations have been completely wiped out without a trace, technologies that we cannot even fathom have existed and space travel was a common factor in society. However, there still are clues left by these ancients about their existence, as well a message for our society waiting to be heard. For some time now, within esoteric communities and spiritual scriptures, we have been finding stories of ancient civilizations such as Atlantic and Lemuria. Lemuria has been told to have been destroyed around 12,900 years ago and then Atlantis to follow approximately 9,000 years ago. These technologically superior groups of individuals had the ability to connect to a state of consciousness and have constant communication with the Earth and the cosmos around them. They acquired the technology to travel in space and had trade agreements and alliances with Extraterrestrial races. They were the pinnacle of humanity’s endeavor to expand their awareness to a level that ushered in peace and unity on the planet. After 1000’s of years in Existence ancient Lemuria was destroyed by an asteroid that exploded in Earth’s atmosphere and rained down over the inhabitants of Lemuria. Few survived making their way and resettling after many years into Atlantis. The comet that destroyed Lemuria went into an elliptical orbit around our sun and a few 1000 years later came back while Atlantis existed (during the ice age) and destroyed their civilization and melting huge amounts of ice creating a worldwide flood ending their lives, technology and any trace of their history. Again humanity went into darkness, until they reemerged soon after in Ancient Egypt. SIDE NOTE: The flood spoke of here is the exact same flood mentioned in Holy Scriptures worldwide, aka Noah’s Flood. We are told that Ancient Egypt dates back to around 3,000 BC and this is accepted by the world since it is the established view of the mainstream. However, did you know that we are unable to carbon date rock? Since we are ‘in the future’ many citizens of the Earth take the word of scientists in dating humanity since we have tools to measure this. Egypt’s past, however, is immeasurable. The rock does not allow us to come up with a certain exact date. We are able to carbon date papyrus, but the papyrus could date back to the last inhabitants of the pyramids, not the original creators. What does this mean for me? You may be asking. Well… what if we have been lied to? What if there is a deliberate or even unconscious cover up of our true history because we cannot perceive and see the signs that have been left to us from the ancients. The Sphinx of Egypt shows signs of immense erosion and also reconstruction on the face to portray a human face. We have found within hieroglyphic scriptures that the face of the Sphinx used to be that of a lion. The Sphinx was built when the constellation of Leo was predominant in the sky and the zodiac the Earth was currently passing through at the time. Currently we are in the Piscean age (since the year zero) and we are moving into the Aquarian age. The last time the Earth was in the age of Leo was about 9,000 years ago and the Sphinx was facing Leo directly at that time. This tells us that we are about 5,000 years off in dating the beginning of Egyptian civilization. 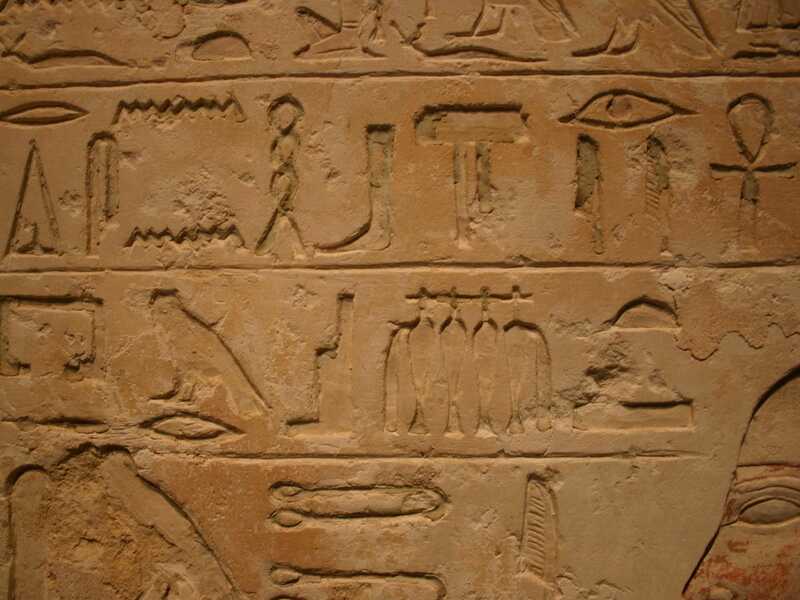 The Egyptians, therefore, existed in a time that we have been told humans were very primitive. We now know that is not the truth. Additionally, Ancient Egypt just popped on to the scene without any evidence of evolution or the growth of the primitive man in the area to the dynasty of Egypt. They appeared out of nowhere. If that is not enough, we just found that there is a hidden hieroglyph that you can point out when looking at the pyramids from space… a measurement of our solar system and a star far away from our planet. The hieroglyph states that the measurement of the pyramid is one earth cycle around the sun (365.25 days), furthermore, the amount of stones in the great pyramid is 2.3 million stones. The message states that the city in the stars originates 2.3 million Earth cycles around the Sun away from Earth. This takes us to a star in the Andromeda galaxy that is exactly 2.3 million light years away from Earth. As mentioned at the beginning of this article I stated that this awareness has been kept in esoteric and spiritual scriptures; therefore, there has always been an argument for lack of evidence in order to redefine the time line. But this evidence was found… archaeological digs have found skeletons on non-human remains, some dating back to over 200,000 years ago. But what evidence is there about these Ancient Civilizations that connect them back to the timeline we have been finding. Before we get into this we need to briefly discuss the scientific mindset of the mainstream and why this information has not been released. For generations science has been about discovery of what we do not know. However, in modern day sciences we are under the limitation of knowing. Once we think we know everything we block of the potential for different possibilities. Furthermore, those possibilities and alternative view of the Earth becomes taboo that will bring ridicule and end your career within the sciences. One such a taboo is the possibility that there was a comet that hit the Earth and ending a great civilization. Archaeologists have been finding, for quite some time, evidence of a great impact on Earth. Last year, 2015, was a huge year for gaining momentum and support within the alternative archaeological movement to present this evidence to the world… and this year is the year it will be disclosed. So… when dating back this cataclysmic impact what date do we find? This comet hit the Earth about 12,900 years ago… the same time as the fall of Lemuria. Furthermore, there was another impact we have now proven occurred… the date for this? 9,000 years ago… the same date range as the estimated fall of Atlantis. Is this a coincidence or are we beginning to discover, within physicality, the true, vast and verifiable history of our planet? Recommendations: Research true world history, pyramid code, ancient civilizations and Graham Hancock to find out a more fully encompassing awareness of our true world history.